Cook 2 cups blueberries, ¼ cup sugar, and a pinch of salt in a medium saucepan over medium heat, stirring occasionally, until berries start to burst, and mixture becomes thick and jammy, 6–8 minutes. Add lemon zest, lemon juice, and 1 cup blueberries. Bring to a boil, then remove from heat. Let compote sit until you are ready to serve. Using an electric mixer on high speed, beat egg whites in a medium bowl until stiff peaks form, 3–5 minutes. Whisk all-purpose flour, whole wheat flour, baking powder, baking soda, and remaining 1 Tbsp. sugar and 1 tsp. salt in a large bowl to combine. Whisk egg yolks, ricotta, buttermilk, and vanilla in another medium bowl. Add egg yolk mixture to dry ingredients and stir with a rubber spatula to incorporate. Fold in one-third of egg whites to lighten, then add remaining egg whites and fold in until no streaks remain. Heat a griddle or a large skillet over medium-low; brush with oil. Working in batches, scoop ½-cupfuls of batter onto griddle. Top each with 2 Tbsp. fresh blueberries. Cook pancakes until bottoms are golden brown and bubbles form on top, about 3 minutes. Flip and cook, reducing heat if browning too quickly, until second sides are golden brown, and pancakes are cooked through, about 2 minutes. 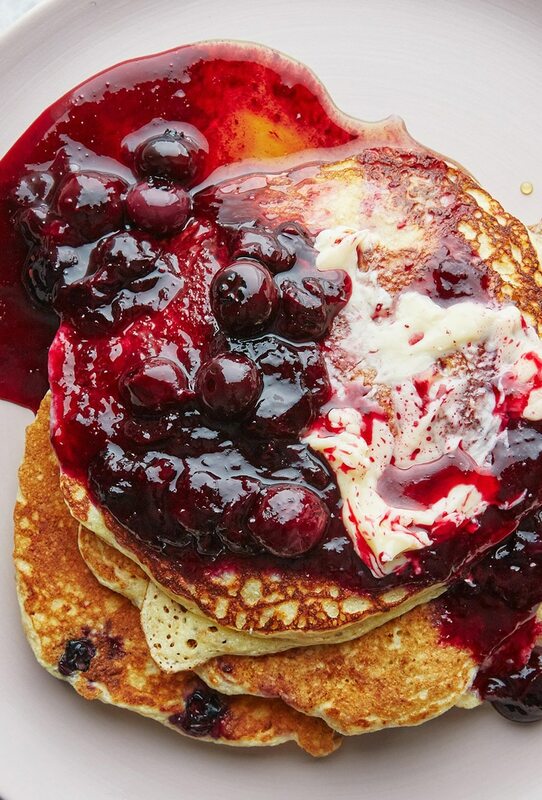 Serve pancakes with warm compote, maple syrup, and butter. Do Ahead: Compote can be made 2 days ahead. Let cool; cover and chill.